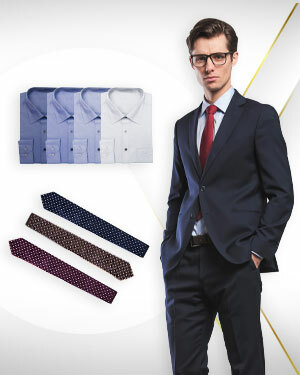 We are offering heavy discounts on four men's tailor made single breasted suits and four men’s custom made business shirts with three matching ties from our classic collection range of men’s custom clothing. The men’s bespoke dress shirts can be customized in different patterns and features like, street stripes, continental stripes, contemporary stripes, tone on tone herringbone pattern, alternating subtle stripes with herringbone pattern, bold stripes, multi color stripes, slim fit, ultra slim fit, comfortable fit, straight fit, triangular collars, round collars, shawl collars, buttoned barrel cuffs, buttons on collars, and many other options. The men’s made to measure suits incorporate stunning slim fit or flare legs men’s custom made pants with features and patterns like straight fit, comfortable fit, flat front, elastic waistband, vertical pockets, hand sewn hems and cuffs, double piped welt pockets, subtle stripes, invisible stripes, two tone inch stripes, chalk stripes, tone on tone framed stripes, and many other options. The classy tailor made suit jackets for men can have slim or comfortable fit with features and patterns like, hand pressed lapel collars, pressed peak collars, embroidered sleeves, padded shoulders, barrel cuffs with boutonniere, french cuffs with boutonniere, flapped pockets, beaded and pearl stripes, Italian stripes, classical English stripes, wide stripes, two tone multiple stripes, two color pinstripes, beaded designer stripes, tonal stripes, and many other options. The ties that we offer are perfect fits for formal events like business meetings and black tie events.